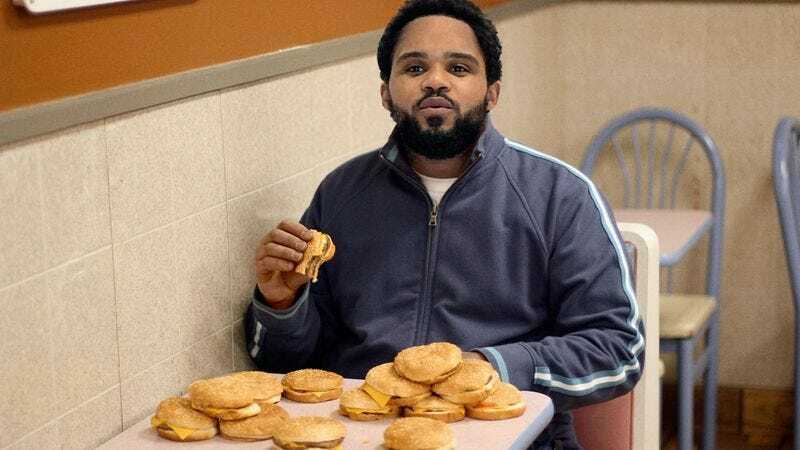 MILWAUKEE—In an effort to clarify complicated financial negotiation procedures, Brewers first baseman Prince Fielder enthusiastically explained the intricacies of salary arbitration to reporters Wednesday by representing important elements of the process with dozens and dozens of cheeseburgers. Fielder, who began the demonstration by carefully organizing 20 cheeseburgers into a neat pile on the table, attempted to simplify the subject by selecting four cheeseburgers to symbolize the player, team, salary dispute, and neutral arbitrator. The two-time All-Star then quickly unwrapped and consumed all four cheeseburgers. "So this cheeseburger is the player, this one is the ball club, and either can submit a dispute over a salary if the player has at least three but no more than six cheeseburger years of service. For our purposes today, we'll say six cheeseburgers," Fielder said while holding up a cheeseburger in each hand, gesturing toward two cheeseburger stacks, and eating three more cheeseburgers. "Now, the arbitrator cheeseburger's decision is binding and determines the number of cheeseburgers for compensation. He could determine that the player deserves six, eight, or 10 cheeseburgers, which I will now eat. " "I'm gonna need about 65 more cheeseburgers over here," Fielder added. Returning to the table with nearly six dozen cheeseburgers, Fielder informed the group of reporters that the neutral arbitrator cheeseburger examines the player's statistical cheeseburgers, which include productivity cheeseburgers, longevity cheeseburgers, and any potential future cheeseburgers, as well as comparing all cheeseburgers to similar player cheeseburgers. By way of example, Fielder took giant bites out of a cheeseburger to depict his .385 on-base percentage. "The arbitrator has to pick the salary figure submitted by this cheeseburger. His agent—Mr. Chocolate Shake over here—reviews the amount of…the amount suggested by the… Are you eating that chicken sandwich?" Fielder asked a patron at the next table. "I need it for my analogy." The 2009 Home Run Derby winner went on to present further statistical analysis by drawing a line graph using packets of mustard and ketchup, which Fielder said were representative of hitting production over a four-year period. "Do you guys think it would become clear if I just ate all these cheeseburgers?" said Fielder, swallowing another four cheeseburgers without waiting for a response. "Yeah, I think it's definitely more understandable for you when I eat them than when I don't eat them." Fielder, who noted that independent arbitrators must scrutinize every aspect of the player's game before they can make a final ruling on a contract, disassembled 11 cheeseburgers by removing the beef patties and recombining them into a greasy tower of meat and cheese between six buns, which he then squished down and pushed into his gaping mouth. Fielder confirmed that he might have omitted an important detail or two concerning the arbitrator's tasks, and swiftly devoured 12 more cheeseburgers in an effort to remedy the error and "even things out." "Anyway," continued Fielder, pausing momentarily to lick mayonnaise from his fingers, "the arbitrator selects one of the two amounts, and he can't settle on something in the middle, as represented by all this lettuce I'm throwing away." When asked what was represented by an order of fried mozzarella sticks in front of him, Fielder explained to reporters that it was just a snack. "Every time I eat cheeseburgers it makes my mouth get all hungry," said Fielder, mentioning that his stomach probably hurt from not eating much for lunch that day. "Now, where was I? Ah, hot buttered contracts smothered in gravy. I mean salary arbitration." Speaking with his mouth full of cheeseburger while struggling to shove an additional cheeseburger into the orifice, Fielder stressed the importance of creating leverage, using a chicken finger to wedge his jaws open. "When you structure a contract, it's a lot like sliding down a buffet with your mouth open," Fielder said. "You can't possibly eat everything in one trip, but you try to get a bunch of good stuff that's gooey, crispy, and potato-y. Also, if you gobble too much, you'll probably fall off and roll right out of the league before the age of 30." "There's this place in West Palm Beach that serves the best porterhouse steaks," Fielder added. As of press time, Prince Fielder and the Brewers had reached a deal to avoid a salary-arbitration hearing after the first baseman agreed to wipe his mouth.